This mini fridge has function of a game default fridge (no modifications). You can place on a top of this fridge any decoration. It doesn't override default game fridge. 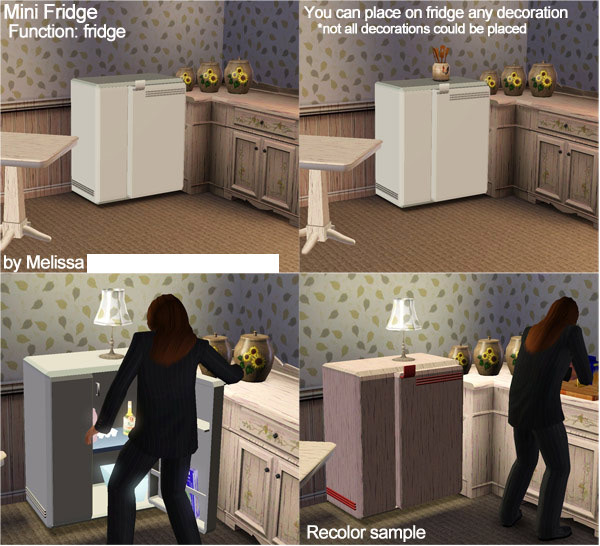 You can recolor or re-texture it with Create-A-Style Game tool (stuff inside of the fridge is not recolorable). *You can place only one item on a fridge. *Not every item could be placed. Besides you can place default game kitchen decorations, several lamps, some of the flowers, most of my custom decorations. You can discover yourself what another custom decorations could be placed. You can find it in buy mode with fridges. In this topic you will download only mesh. On the picture is example of wooden recolor. 1370 people have said thanks to MelissaMel for this download. Outdated - BUYABLE Cullinary Career Refrigerator - "MinusOne Kelvin Refrigerator"